Helbing Lipp Recny Architects developed a three-phased expansion program for this suburban congregation to accommodate its anticipated growth and preschool operation. 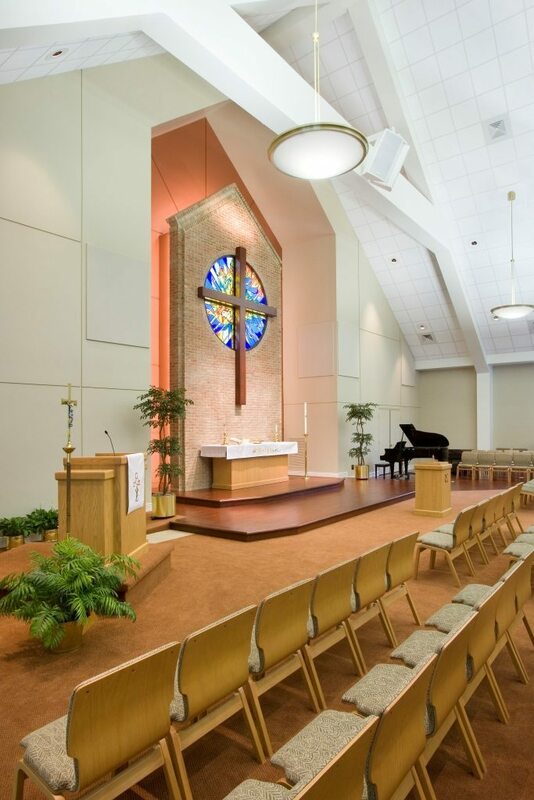 The first phase included a new sanctuary center for 260, a new foyer/narthex, and a connection to the existing building. The existing worship space was repurposed as a multipurpose room. The new sanctuary’s interior volume takes its cue from the original worship space that served the congregation for a number of years. There are large windows on each side of the space for natural lighting. The feature of the sanctuary is its reredos behind the altar; it is a backlit brick wall with a beautiful circular stained glass window and wooden cross. Future phases include a new office suite to be situated between the new and existing buildings and a two-level preschool building that will go behind the sanctuary and offices.